Beautifully printed money order receipt from the Cunard Lines issued no later than 1931. This historic document was printed by the Michaelson Lithograph, Brooklyn, New York and has an ornate border around it with a vignette of a Cunard Lines Ship. This type of money order was used by Russian immigrants in the U.S. to transfer money back to the old country. 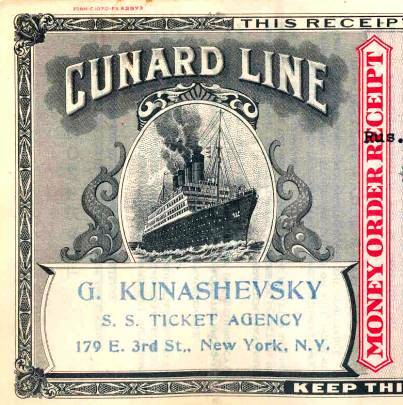 The money order was issued in the United States and carried by the Cunard Lines to the destination point. Carnival Corporation & plc is a global cruise company with a portfolio of 12 distinct brands comprised of the leading cruise operators in both North America, Europe and Austrailia. Carnival Cruise Lines, Holland America Line, Princess Cruises, Seabourn Cruise Line, Windstar Cruises, AIDA Costa Cruises, Cunard Line, P&O Cruises, Ocean Village, Swan Hellenic, and P&O Cruises Australia are all included in this group. Together, these brands operate 77 ships totaling more than 128,000 lower berths with nine new ships scheduled for delivery between November 2004 and December 2006. It also operates the leading tour companies in Alaska and the Canadian Yukon, Holland America Tours and Princess Tours. Traded on both the New York and London Stock Exchanges, Carnival Corporation & plc is the only entity in the world to be included in both the S&P 500 and the FTSE 100 indices. Known for their terrific service, Princess Cruises and the Cunard Line has the world famous Nina Kass, as their vice president of Customer Service.